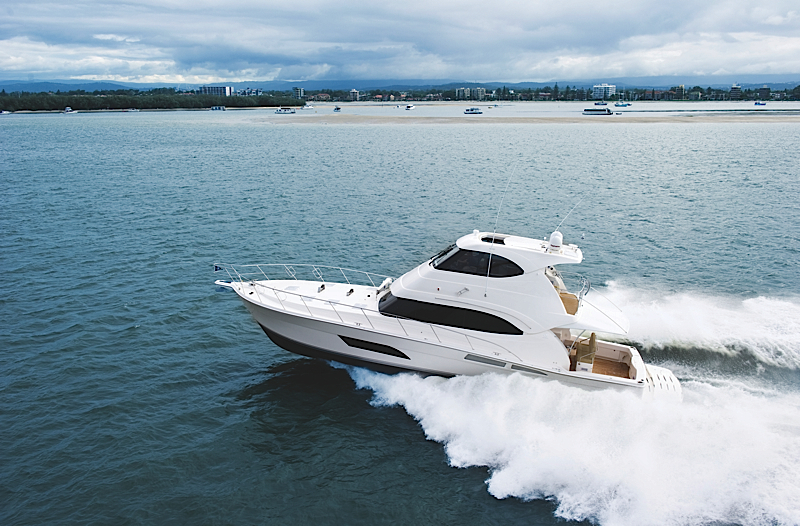 Australian boat builder Riviera has launched their new 61 Series II Enclosed Flybridge with a raft of engineering and design enhancements. They have built upon the success of the 61 Series I, featuring a Frank Mulder (the Dutch superyacht specialist) designed hull, which was launched in 2008 and at the time highly regarded Australian Captain Bob Jones described it as the best running boat in the Riviera fleet. 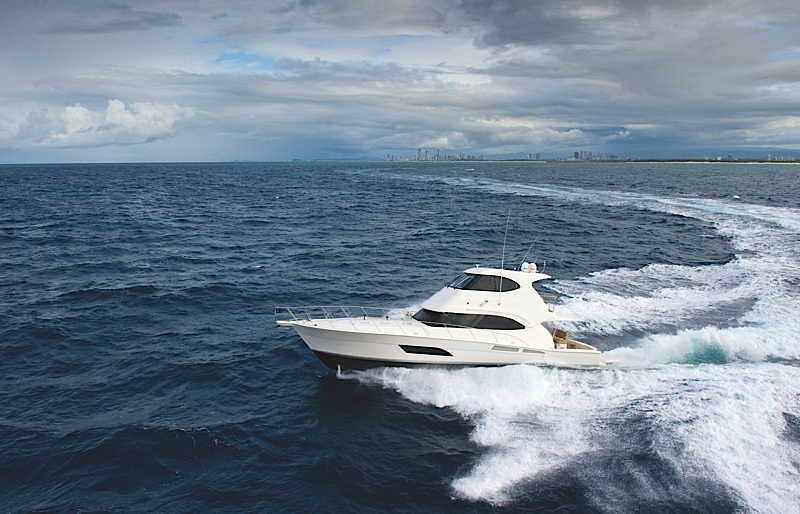 Now with a number of ground breaking design changes the 61 Series II offers a whole lot more capability, offshore and at anchor and is available with either an enclosed flybridge or open flybridge. 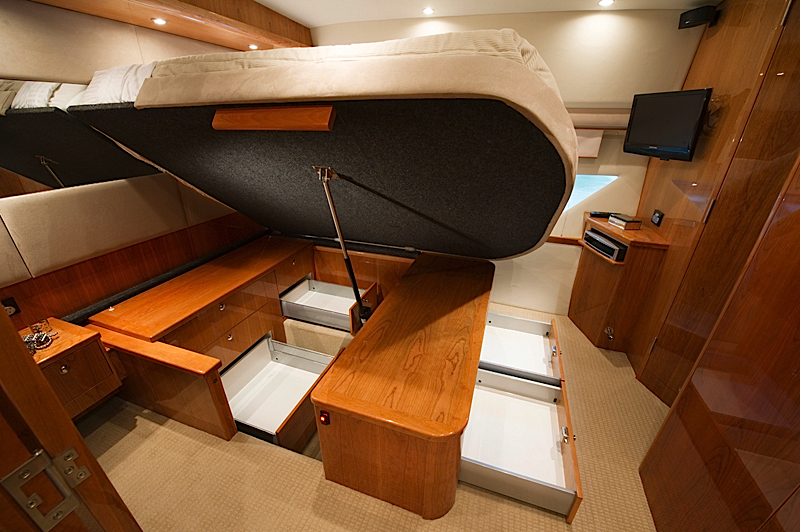 The new 61 features a galley positioned central to the party, a cockpit that is an extension of the live-aboard space inside, a master stateroom that is bathed in light and fresh air, an enclosed flybridge that serves as a sky lounge and refinements to the hull that further enhance performance and sea keeping ability. The new galley is positioned aft, adjacent to the saloon bulkhead, and separated from the large sociable cockpit space by a hinged awning window and full tinted glass door. The result is an extension of light and space from outside in, with guests easily able to converse with whoever is in the galley. The latest European appliances are housed within cabinetry with soft close drawers and encased in high gloss timber – the hallmark of every Riviera, and the new 61 is certainly no exception. A Miele extraction hood vents cooking odours to the outside through the flybridge structure. Non-slip and hard wearing Amtico flooring is a striking feature of the galley, and is easily maintained. All refrigeration and dishwasher drawers are held in place at sea with machined aluminium cam locks. Galley appliances comprise a Miele combination microwave and oven, efficient induction cooktop and slimline dishwasher are installed within the U-shape galley, set to port and out of the way of the main fore and aft traffic corridor. A huge working area set atop a solid surface bench top features an underslung stainless steel sink, an enclosed 27 litre waste bin, dedicated cup, plate, pot and cutlery drawers and ample storage. Riviera designers have carefully ensured that every amount of available space has been fully utilised. Forward of the galley, also to port, there is an option for twin bar stools and an L-shape lounge with convertible dinette table with seating capacity for six plus two. 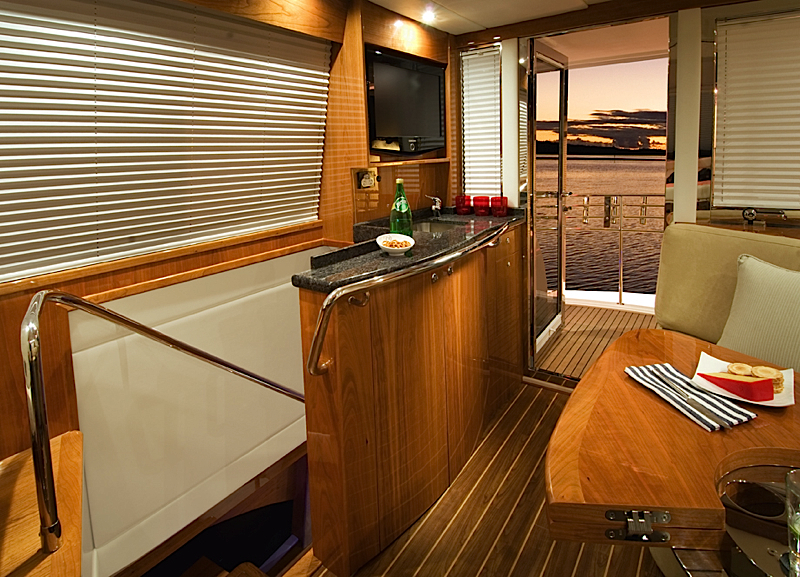 Opposite the galley to starboard there is a bar area with ice maker and fridge set under ergonomically raked flybridge stairs, with solid teak treads nested on flawless tig-welded stainless steel supports. A special feature of the saloon bar is an electric lift glassware cabinet which retracts into the varnished cabinetry while under way, yet rises to the occasion at the touch of a button. Powered by whisper quiet German drive technology, the cabinet features LED backlit shelving and is sure to impress. Forward of the bar there is a spacious U-shape lounge and dinette with seating for 12 well positioned to take advantage of the large, 40 inch TV mounted on the forward dash. Throughout the new 61 Series II there is a fine blend of varnished timber and fabric wall panelling, creating a soft and acoustically correct ‘feel’ to the interior. Recessed grab rails are set into the head-liner, as is an overhead locker, while air-conditioning is ducted almost invisibly from behind a varnished timber facia panel that run virtually the full length of the saloon. The very large main saloon is bright and airy, with 360 degree tinted windows and offering views from every seating angle and position. This is the social hub of the vessel. However, the party is not constrained to stay just indoors. 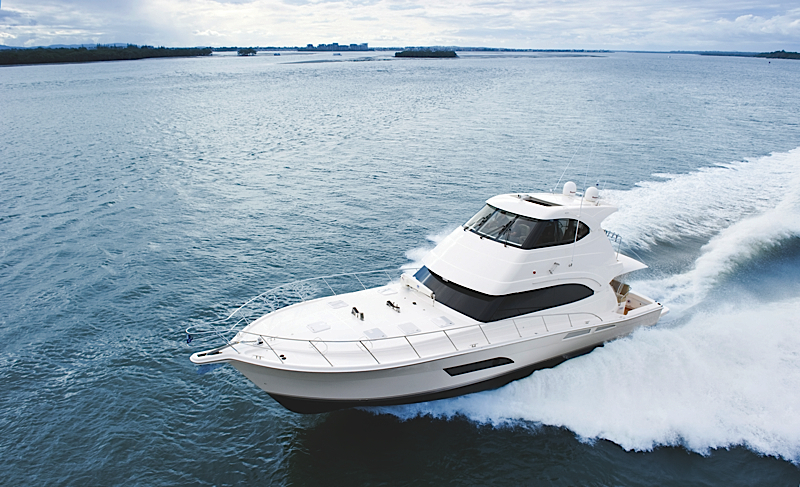 The new 61 Series II has taken its cue from the much larger Riviera 70 and has incorporated social seating into the cockpit, which is no longer the sole domain of the sports fisherman. The cockpit now doubles as an alfresco dining experience, with optional opposing fore and aft facing mezzanine seating either side of a solid teak table. The mezzanine also contains a fridge and storage space. 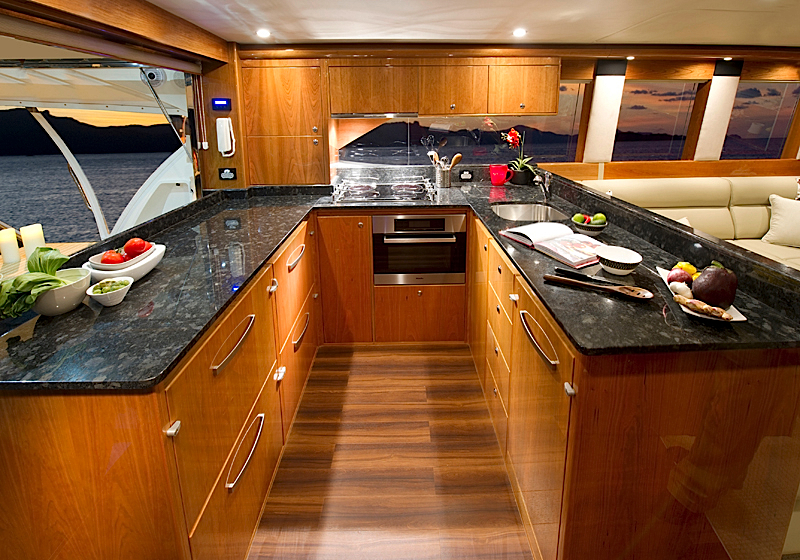 A full barbecue centre with sink, rubbish bin and storage is located centrally within the transom, sealed from the weather when underway but creating an entirely different focus for the party at day’s end. The practicalities of a sport fisher with fully optioned fighting cockpit are enhanced with features like below deck self-draining fish bins, game chair mounting plate solidly glassed into the cockpit floor, and recessed toe kicks. An extensive options list covering rod holders, live bait tank wells and outriggers ensures the full versatility of the 61. 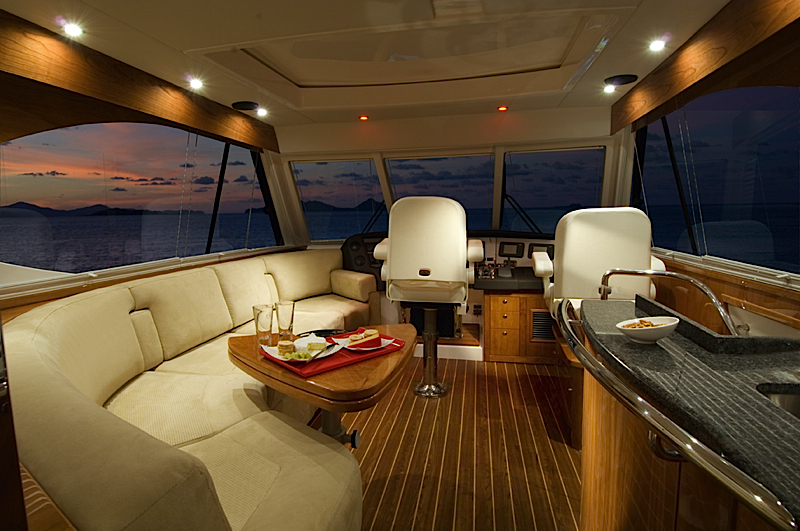 Overlooking the cockpit is the spacious enclosed flybridge, featuring forward helm and aft docking station. 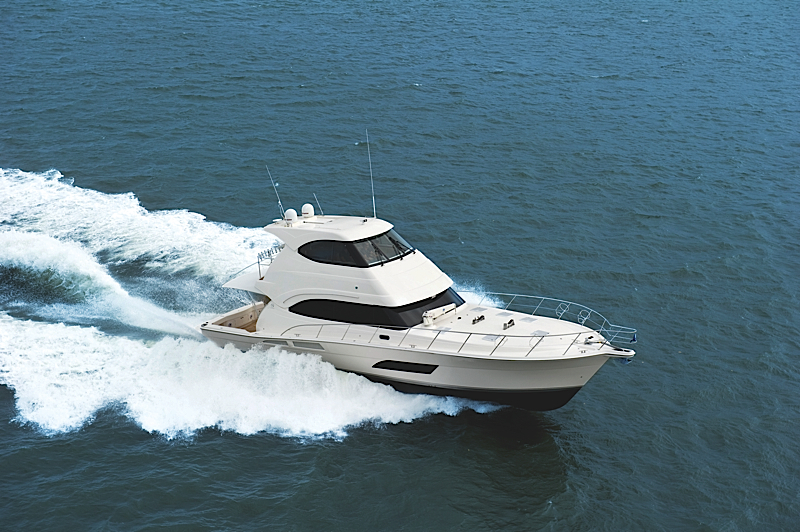 The open flybridge option features an aft helm with a U-shaped lounge around a convertible table with a settee opposite. The enclosed flybridge features a hinged awning window and glass door that bolt open to bring outdoors in and unify the space. Wrap around seating to port features folding arm rests with functional storage underneath and a drop down dinette table. This is a truly luxurious sky lounge. To starboard there is a wet bar with bottle and glass storage. A 26 inch flatscreen TV is wall mounted above the wet bar. A draw fridge is located under the base of the pedestal – mounted crew seat to starboard which fronts the forward dash. The upholstered wrap around forward helm can accommodate up to three 12 inch displays. Air-conditioning ducts can be vented against the windscreen to demist the glass in humid conditions. Opening side windows feature positive seals and deep drainage slots. Night-time privacy can be assured with retractable venetian blinds. And throughout the 61 energy saving LED lighting illuminates this social space with a warm ambiance. 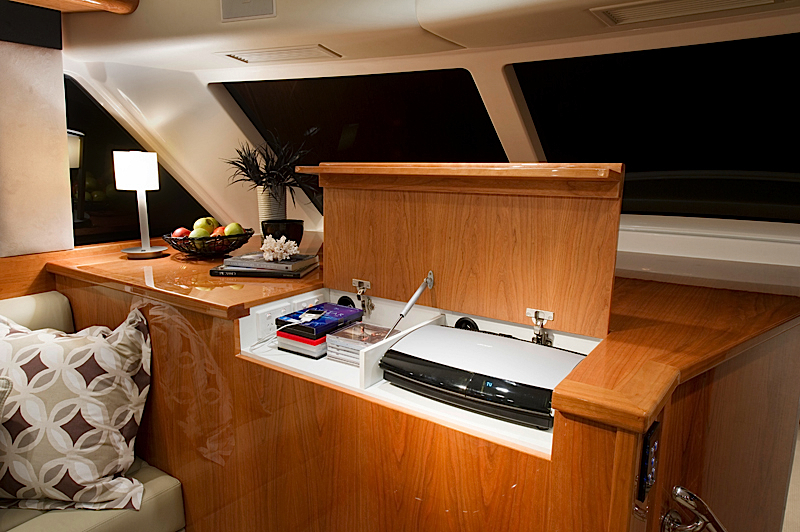 The aft docking station is located aft to the starboard side of the external flybridge door with excellent visibility of the cockpit and aft quarters of the boat behind. 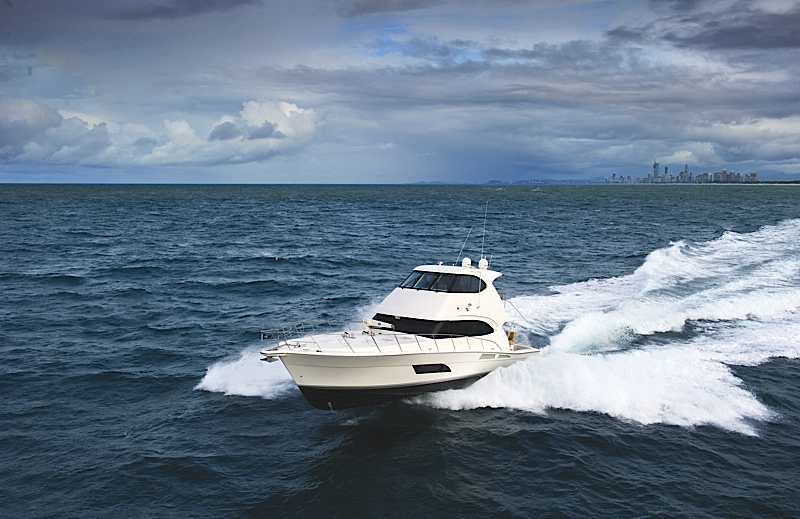 There is an option to upgrade to Palm Beach single side mount engine control levers, which are a favourite with sport fishermen. 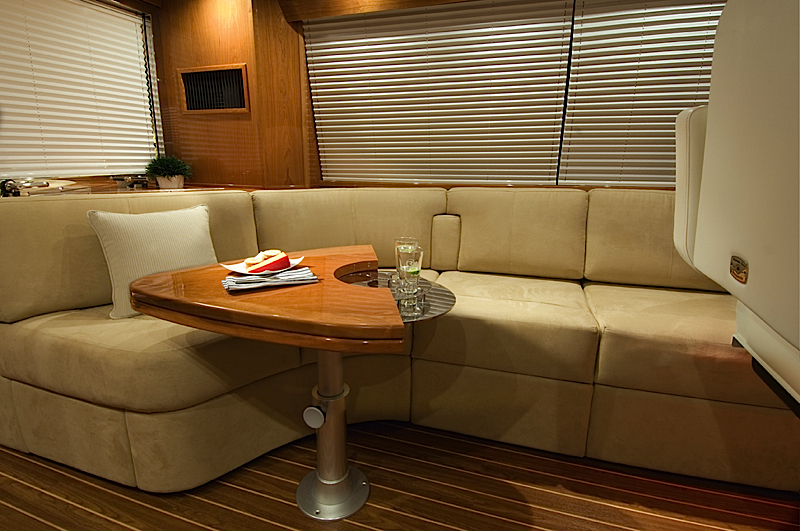 To port an aft-facing lounge accommodates two people who wish to escape attention indoors, or talk privately while the party continues below in the cockpit. 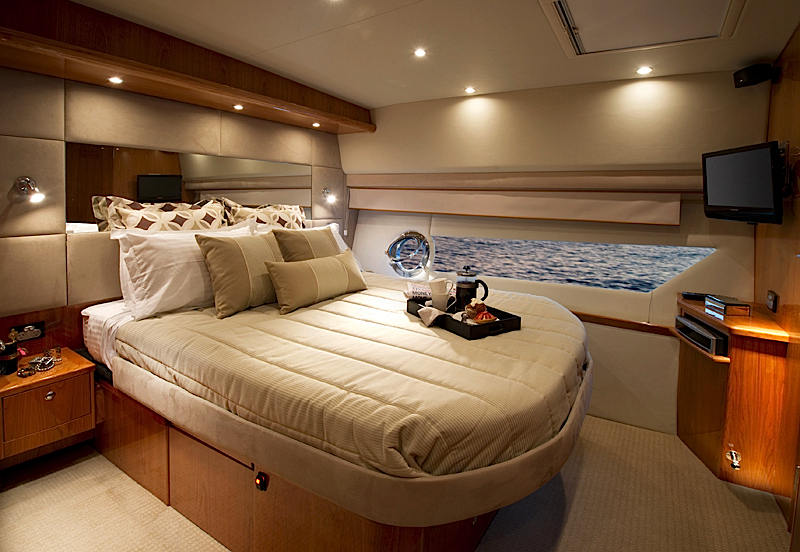 At day’s end, the master suite below decks will be a haven for weary travellers. Acoustically shielded using a blend of soft fabric panelling, wool carpeting and visually stunning high gloss timber, the new 61 Series II now features a flood of light and fresh air from a massive horizontal fixed port mounted in the hullside. Comprising fixed laminated safety glass and opening portholes handcrafted from stainless steel and wired to the boat’s ignition alarm system, the newly designed hull windows bring a flood of light and fresh air into the main cabin to port and into one of two guest cabins to starboard, depending upon which option is chosen by the owner. The starboard day head also benefits from this fixed port light. In the master suite a queen sized bed aligned fore and aft now takes advantage of the large port lights, while a host of cleverly engineered features make storage of luggage and clothing easy. Proven German technology electrically lifts a portion of the queen sized mattress to reveal a spacious step-down storage locker, with large soft-close drawers. Cedar-lined hanging lockers and bedside drawers complement a cabin that includes its own ensuite, with shower cubicle, vacu-flush toilet, raised porcelain sink and solid surface bench top. The VIP guest cabin features a queen size island bed and offers its own ensuite with ample drawer and hanging locker storage. An optional three cabin layout is available with extra space absorbed by the VIP guest cabin, to include a private lounge or a writing bureau. 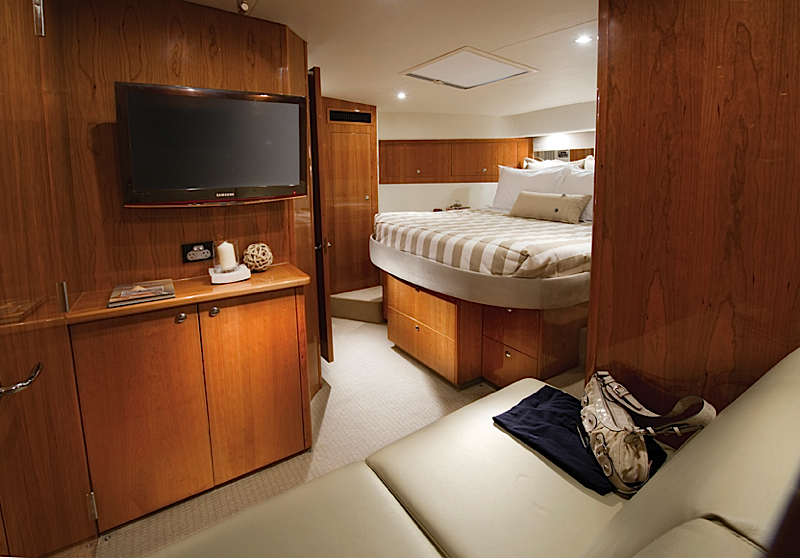 Regardless of optional layout, the below decks accommodates Miele washer and drier, either totally enclosed behind cabinetry or mounted below a bunk in the starboard aft cabin. 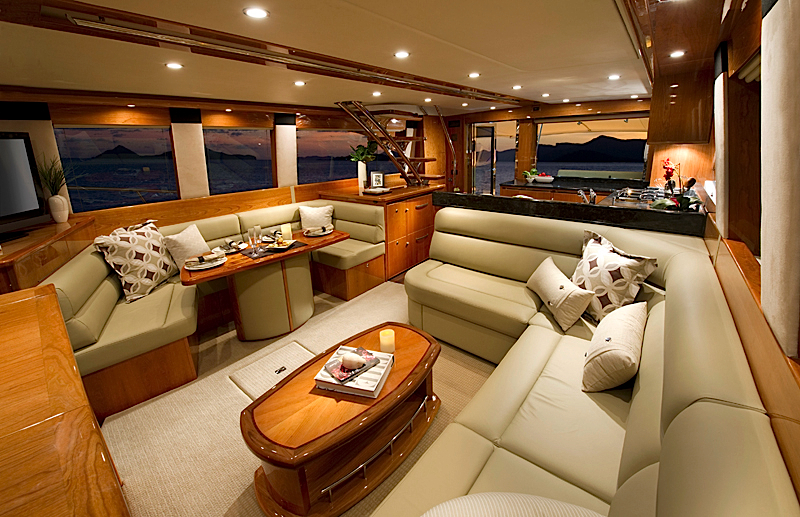 The fabric lined companionway and stairway link the accommodation space with the main saloon. 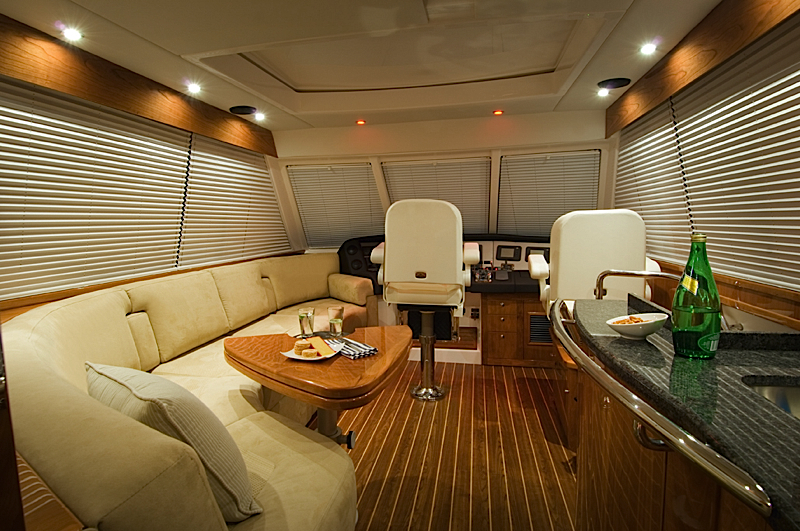 This interior finish has proven very popular on the 70 Flybridge as it is hard wearing to high traffic and enhances the accommodation space acoustics. In engineering terms the 61 Series II retains its original shaft drive configuration, and base power is twin 1015hp Caterpillar diesel engines with a fuel capacity of 5,650 litres (1,492 gallons) and depending upon which engine option is selected a top speed of around 28-34 knots. The new Series II incorporates the latest technology including state-of-the-art digital switching for all DC electrical components, using the proven C-Zone CAN bus system to create fingertip control of electronic functions. 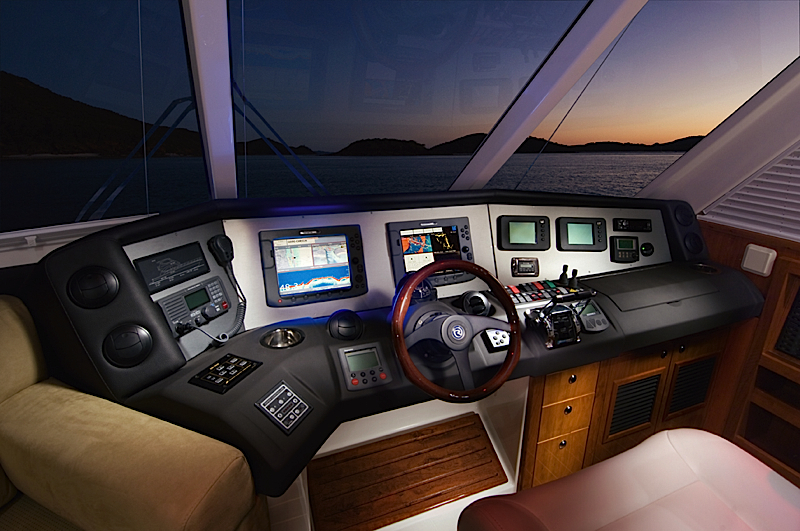 At the touch of a 10 inch LCD screen – positioned in a cabinet at the base of the flybridge steps – a multitude of pre-set functions can be activated. Whether you are at sea or in party mode at the marina, the C-Zone digital switching system will present a specific menu offering control of all necessary functions. Of course, C-Zone allows for manual override so owners can customise the system to suit their personal requirements. 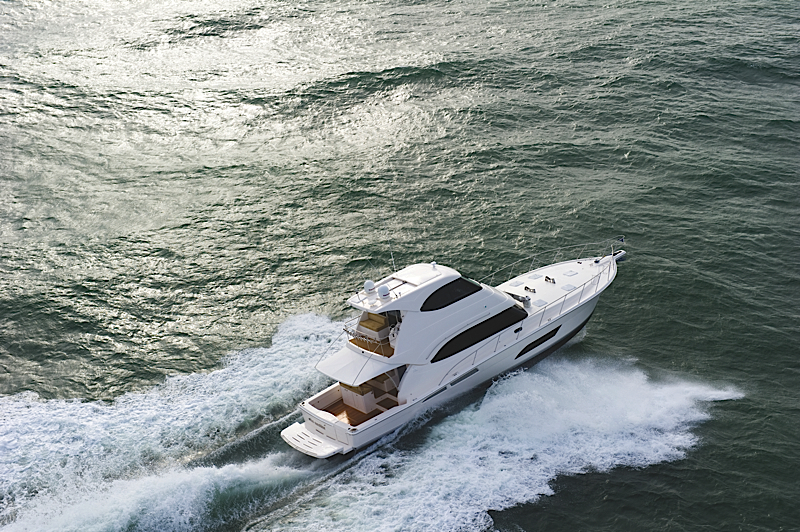 The new 61 Series II is a seaworthy, highly capable long-range offshore vessel. 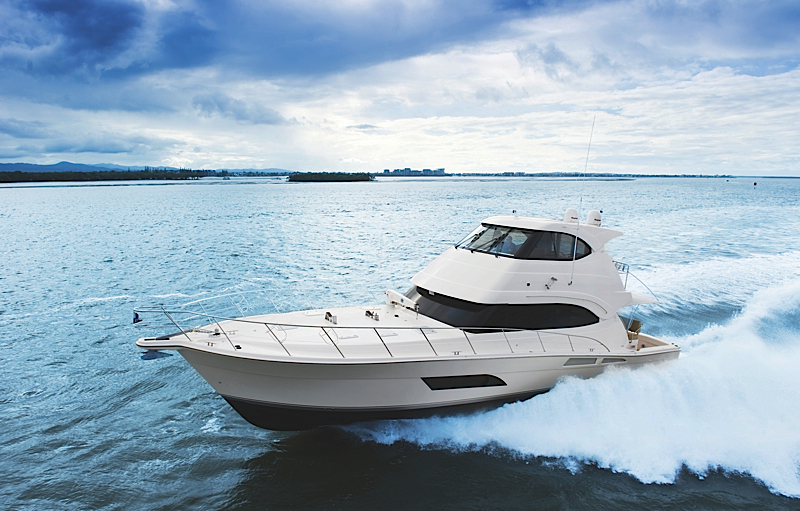 Riviera’s in-house naval architect Alan Dowd has worked with the Riviera design team to further enhance running trim and performance. Alan has also split the midship fuel tank to lower the rolling momentum at sea and at rest. 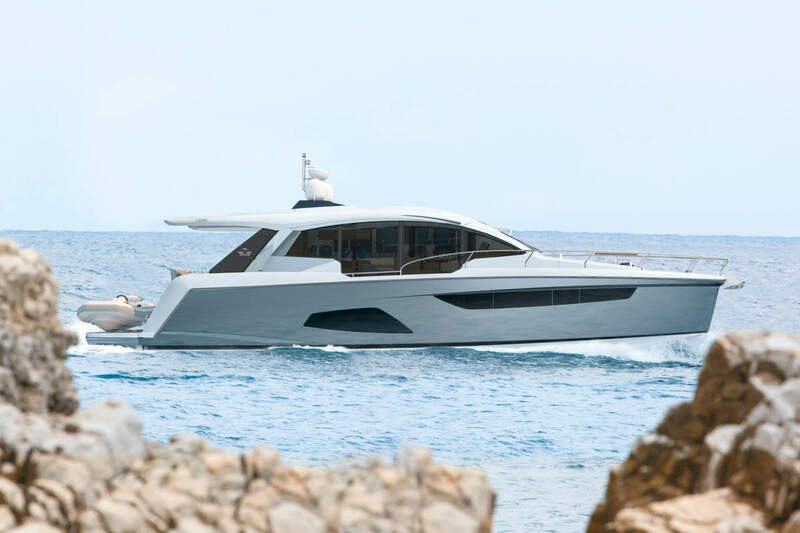 The highly qualified naval architect has pared away weight from non-structural components – particularly in the upper decks – to ensure the 61’s responsive and fuel efficient.